Is that not amazing or what? Its their top of the line Cigar Yacht and it’s a beauty! isn’t it just all white and beautiful! But isn’t this too big for a girl to go zooming around in? Seriously, this is serious macho stuff here. 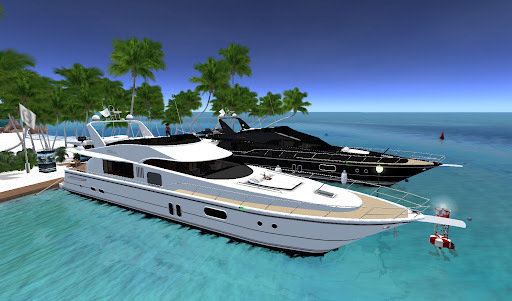 I think these yachts are amazing. They are also very expensive, like the one I like is L$12,000! So I can’t afford to buy this then be afraid to actually use it. And I was looking for a place to anchor it too. As in real life, buying a yacht is the joyous part of this then there’s the port you anchor at. There are portage fees no matter where you go. But there’s a part of me that my rational side is squishing right now, it’s saying, “can you imagine the parties we could have with girlfriends!” YO! 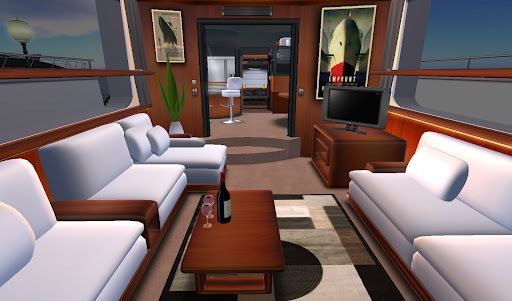 This entry was posted in Journal and tagged Boating, Exploring, Photography, Second Life. Bookmark the permalink.